A person does not have to have a doctorate in religion, an "expertise" on the kaballah or be an apostle in a gnostic church to be close to and begin to "know" the Magdalen. It is the yearning, the longing in every fiber of our being and internal essence that lets Magdalen know we are ready to receive her love, her friendship, her need; and in return she will shed her veils and reveal herself. The Red Lady is also the Lady of many tears. As much as we begin to need and long for her, she will need and long for us. She has a definite personality and is more "human"-like than anyone could ever realize. The written words of men will point the way to where she is. Ultimately, words fall away and it's the Inner Experience fueled by our longing and passion that brings us eye to eye with Magdalen. I yearn to know what she was like in her life with Yeshua. She bore the brunt of scorn and doubt from a group of males who thought a woman could not know any eternal truths. 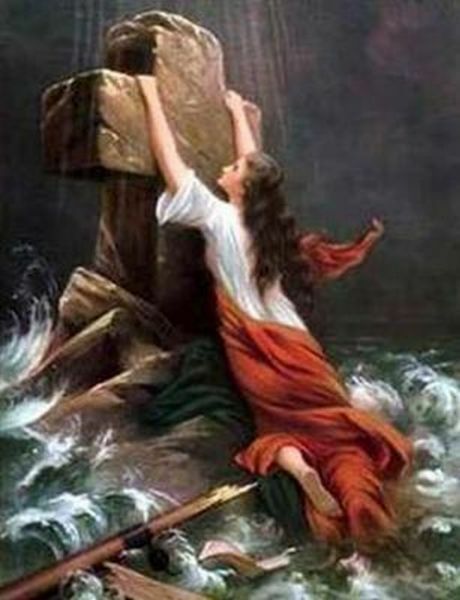 They were astonished that Yeshua broke social codes and placed not only Magdalen, but other women on the "Rock" as teachers and advisors. It is indeed logical to assume that Magdalen taught Yeshua much. It is sad that men decided to obliterate her true role from history. In 2006 Earth she is very much at work in the hearts of humans. We, as humans, tend to make Eternal Truths too complicated. Magdalen knows who loves her and yearns for her. You can do all the rituals and prayers you want, but if you do not have the longing and need for her in every fiber of your being, it is empty deeds and words. I do realize that the ultimate goal of my loving Magdalen and Yeshua is to place my lost Crown Of Light back upon my spiritual self and rise back up into my Holy essence and Birthright. Magdalen never asked me to worship her at an altar. In my tears I cried out for her. She came as a sister, not as a Goddess or an Icon. She hears her name called most clearly through pain and longing for her.